2 Prasad N, Murdoch DR, Reyburn H, Crump JA. Etiology of Severe Febrile Illness in Lowand Middle-Income Countries: A Systematic Review. PLoS One 2015;10:e0127962. 5 World Health Organization. 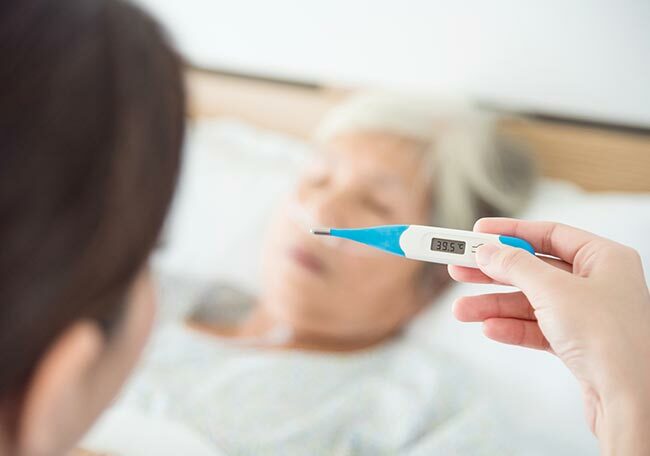 WHO informal consultation on fever management in peripheral health care settings: a global review of evidence and practice. 2013. www.who.int/malaria/publications/atoz/9789241506489/en/. 11 Manock SR, Jacobsen KH, de Bravo NB, etal . Etiology of acute undifferentiated febrile illness in the Amazon basin of Ecuador. Am J Trop Med Hyg 2009; 81:146-51. 13 Mørch K, Manoharan A, Chandy S, etal . Acute undifferentiated fever in India: a multicenter study of aetiology and diagnostic accuracy. BMC Infect Dis 2017; 17:665. 17 Smego RAJr, Sarwari AR, Siddiqui AR. Crimean-Congo hemorrhagic fever: prevention and control limitations in a resource-poor country. Clin Infect Dis 2004;38:1731-5. 21 Leder K, Torresi J, Libman MD, etal. GeoSentinel Surveillance Network. GeoSentinel surveillance of illness in returned travelers, 2007-2011. Ann Intern Med 2013; 158:456-68. 25 Limmathurotsakul D, Golding N, Dance DA, Messina JP, Pigott DM, Moyes CL, etal . Predicted global distribution of Burkholderia pseudomallei and burden of melioidosis. Nature Microbiology 2016; 1:1500810.1038/nmicrobiol.2015.8. 28 Treanor JJ. Influenza. In: Bennett JE, Dolin R, Blaser MJ, eds. Mandell, Douglas, and Bennett’s Principles and Practice of Infectious Diseases. 8th ed. Elsevier Saunders, 2015. 29 Crump JA, Gove S, Parry CM. Management of adolescents and adults with febrile illness in resource limited areas. BMJ 2011; 343:d4847. 10.1136/bmj.d4847 21824901 30 World Health Organization. Guidelines for the treatment of malaria. WHO, 2015. 32 World Health Organization. Guidelines on Clinical Management of Chikungunya Fever. 1st ed. WHO-SEARO, 2008. 36 Watt G. Leptospirosis. In: Magill AJ, Hill DR, Solomon T, Ryan ET, eds. Hunter’s Tropical Medicine and Emerging Infectious Disease. 9th ed. W.B. Saunders, 2013: 597-60110.1016/B978-1-4160-4390-4.00074-6. 37 Pan American Health Organization. Tool for the diagnosis and care of patients with suspected arboviral diseases. PAHO, 2017. 40 Crump JA, Sjölund-KarlssonM, Gordon MA, Parry CM. Epidemiology, Clinical Presentation, Laboratory Diagnosis, Antimicrobial Resistance, and Antimicrobial Management of Invasive Salmonella Infections. Clin Microbiol Rev 2015; 28:901-37. 41 Low JG, Ong A, Tan LK, etal . The early clinical features of dengue in adults: challenges for early clinical diagnosis. PLoS Negl Trop Dis 2011; 5:e1191. 46 Varghese GM, Trowbridge P, Janardhanan J, etal . Clinical profile and improving mortality trend of scrub typhus in South India. Int J Infect Dis 2014; 23:39-43. 51 World Health Organization. FIND, CDC. Malaria rapid diagnostic test performance summary. Results of WHO product testing of malaria RDTs: rounds 1-7 (2008-2016). 52 Zhang H, Li W, Wang J, etal . NS1-based tests with diagnostic utility for confirming dengue infection: a meta-analysis. Int J Infect Dis 2014; 26:57-66. 53 World Health Organization. Dengue: guidelines for diagnosis, treatment, prevention and control. 2009. http://www.who.int/rpc/guidelines/9789241547871/en/. 56 Storey HL, Huang Y, Crudder C, Golden A, de los Santos T, Hawkins K. A Meta-Analysis of Typhoid Diagnostic Accuracy Studies: A Recommendation to Adopt a Standardized Composite Reference. PLoS One 2015; 10:e0142364. 57 Islam K, Sayeed MA, Hossen E, etal . Comparison of the Performance of the TPTest, Tubex, Typhidot and Widal Immunodiagnostic Assays and Blood Cultures in Detecting Patients with Typhoid Fever in Bangladesh, Including Using a Bayesian Latent Class Modeling Approach. PLoS Negl Trop Dis 2016; 10:e0004558. 59 Saraswati K, Day NPJ, Mukaka M, Blacksell SD. Scrub typhus point-of-care testing: A systematic review and meta-analysis. PLoS Negl Trop Dis 2018;12:e0006330. 65 World Health Organization. Human leptospirosis: guidance for diagnosis, surveillance and control. World Health Organization, 2003. 66 Vijayachari P, Sehgal SC. Recent advances in the laboratory diagnosis of leptospirosis and characterisation of leptospires. Indian J Med Microbiol 2006; 24:320-2. 68 Khaki P. Clinical laboratory diagnosis of human leptospirosis. Int J Enteric Pathog 2016; 4:1-710.17795/ijep31859 . 69 Niloofa R, Fernando N, de Silva NL, etal . Diagnosis of Leptospirosis: Comparison between Microscopic Agglutination Test, IgM-ELISA and IgM Rapid Immunochromatography Test. PLoS One 2015; 10:e0129236. 70 Rosa MI, Reis MFD, Simon C, etal . IgM ELISA for leptospirosis diagnosis: a systematic review and meta-analysis. Cien Saude Colet 2017;22:4001-12. 73 Chansamouth V, Thammasack S, Phetsouvanh R, etal . The Aetiologies and Impact of Fever in Pregnant Inpatients in Vientiane, Laos. PLoS Negl Trop Dis 2016;10:e0004577. 77 Bonell A, Lubell Y, Newton PN, Crump JA, Paris DH. Estimating the burden of scrub typhus: A systematic review. PLoS Negl Trop Dis 2017;11:e0005838. 78 World Health Organization. Handbook for clinical management of Dengue. 1st ed. WHO, 2012. 79 World Health Organization. Guidelines for the Treatment of Malaria. 3rd ed. WHO, 2015. 81 Tubiana S, Mikulski M, Becam J, etal . Risk factors and predictors of severe leptospirosis in New Caledonia. PLoS Negl Trop Dis 2013; 7: e1991. 82 Nicholson WL, Paddock CD. Rickettsial (spotted & typhus fevers) & related infections, including anaplasmosis & ehrlichiosis. In: Brunette GW, ed. CDC Yellow Book 2018: health information for international travel. Centers for Disease Control and Prevention, 2017: 297-302. 88 Meyers B, Salvatore M. Tetracyclines and chloramphenicol. In: Bennett JE, Dolin R, Blaser MJ, eds. Mandell, Douglas, and Bennett’s Principles and Practice of Infectious Diseases. 6th ed. Churchill Livingstone, 2005.